A new kitten is a fun time for all in the house. They have so much energy, they are constantly up to mischief and they are possibly the cutest thing ever created! Kittens will arrive at any time from 7 weeks to 14 weeks. Many breeders of pedigree kittens keep them until they are 14 weeks. Up to this time, they are learning from their mum many essentials such as grooming and behaviour. It is a good idea to get the fundamentals of nutrition correct at this early stage. Kittens have small teeth and may find hard food difficult to eat when very young but they quickly learn to adapt. Feeding a combination of wet and dry food when older, will often lead to obesity. It is advised to have a minimum of one feeding bowl per cat and one extra, in different parts of the house. (This same advice goes for litter trays and water bowls). A good quality dried food, such as Royal Canin Kitten or Hills Science Plan, will deliver all the nutrients she needs and help to improve skin condition, immunity and gastrointestinal health. Many people put the feeding bowl in the busiest part of the house, the kitchen. This can often be too hectic for cats especially if there are children in the house. It is also advisable to keep the bowl out of sight from large windows and doors to give your kitten security from cats outside and so reduce stress. Protects against Feline Rhinotracheitis Virus, Feline Calici Virus, Feline Panleukopenia virus and Feline Leukaemia Virus. Annual boosters - starting 1 year after 2nd vaccination. We have a fantastic kitten pack offer currently running - this includes both vaccinations, 3 months flea and wormers and a microchip, all for just £70. Kittens should be kept indoors until at least 3 weeks after their second set of vaccinations. We also recommend that they are not allowed out unsupervised until after they are spayed or castrated at 6 months. When you start to let them outside, let them out when hungry so they don’t stray far. Go Green! Please leave an email address or a mobile telephone number for vaccination reminders! 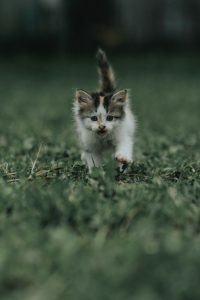 In general, kittens should have a broad spectrum wormer (panacur, drontal or milbemax) when 10 weeks old and then have monthly flea treatments. If you want to ensure that your cat doesn’t pick up a flea infestation which can take months to resolve we recommend a combined worm and flea treatment (advocate) as a spot on monthly and a tapeworm tablet or spot on every 3-6 months depending on lifestyle. We only stock the best products available and although they may appear more expensive, it is important to realise that they are quite cost-effective, once broken down to a cost per month and compared with other similar products. These products are often more effective and safer than over the counter products. Try to get your kitten used to being brushed on a daily basis. The interaction is great and will make the bond with your kitten stronger. It is also really important in cats with long hair as they will need a daily groom to prevent matting of fur externally and hairballs in their stomachs. At the same time try to get her used to having her teeth, ears and paws examined. 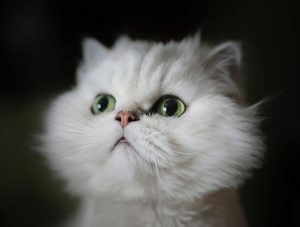 Some cats with flat faces such as Persians will also need their eyes cleaned daily. Cats scratch to keep their nails sharp but also to leave their scent on prominent objects. They like natural fibres, running vertically, securely fastened at a suitable height. This ensures that when they stretch up they can have a good scratch. They also like to have the scratching post positioned just within the main living area. Introducing a kitten into a home with one or more other cats can be stressful for the existing occupants. Please remember the rules about numbers of feeding bowls and litter trays. It would be a good idea to let the other cats get used to the kittens scent before letting them interact fully. This may require keeping the kitten in a room away from the others for a couple of days but putting her bedding where the other cats can examine it. Pheromone diffusers or sprays such as Feliway are brilliant at helping in these situations. If you want any help please email or give any one of the team a call. We also run nurse clinics for more difficult cases. If you want any help or further information please email or pick up the phone and give any one of the team a call. ensure your cat makes it back to you if they go missing and only costs £15. We recommend to spay/castrate your cat around 6 months old but this can be done from as early as 4 months of age if you have both male and female kittens or they are showing unwanted behaviour. 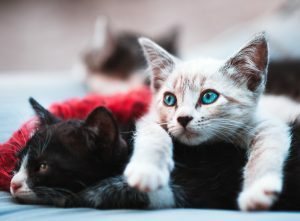 Neutering a male cat at an early age will prevent spraying, fighting, reduce the chances of catching FIV (a virus similar to HIV in people) and nearly always make him more friendly. Spaying a female cat will prevent hormonal uterine infections (pyometra) and reduce the chances of getting uterine and mammary cancer. It also prevents unwanted pregnancies and means you don’t have a hormonal cat cycling in and out of heat every 3 weeks for 6 months. Pet healthcare insurance is now commonplace. It can offer you protection against veterinary fees for illness or accident, cover for boarding kennel fees if you have to go into hospital, accidental damage and third party liability. Fractured bones and long term illnesses can run into costs of thousands of pounds. When choosing a plan we advise a life cover policy. If your pet falls ill with an ongoing affliction life cover will cover your pet for the whole term of affliction, rather than a year long policy. Some insurance companies amongst others – Pet Plan, Direct Line, Argos, Tesco, Aviva and others.